Horrorville Finale... Click if You DARE! And on an unrelated note, an old animated favourite returns! Remember this series from the 1980's? This is, I believe, the last arc of Superman I read before giving up the title for a few years at the turn of the century. It came right after the two John Rozum books I posted the other day. Superman had not too long before resolved the Superman Red/Superman Blue situation with his battle with the Millenium Giants and the Dominus story that had each of his four titles taking place in a different "age" of comics, kinda. At this point I'm pretty sorry to say he was pretty much treading water and you can see why after Infinite Crisis they pared his books down to just two a month, as treading water is bad enough on its own, but four times a month is going to kill interest quick. Feeling in the mood to post more Bloodlines since it's probably one of my favorite things to come out of the 90's. Last issue we met Layla the space exploring Captain from L.E.G.I.O.N as she teamed up with Lobo. This story we have the team-up of Steel and a man named Tom soon to be known as Edge, the "blade-hurling community hero". One thing I loved about Bloodlines was how time specific it was to the DCU. At the time it was published Superman was still "dead" from his battle with Doomsday. Batman had his back broken and was replaced by Jean-Paul. Slade was less of a villain and a anti-hero and so on so it was fun to see a story showing Steel being a hero when he first showed up filling in for Superman alongside the other three Supermen. 18 pages from a 54 page story. And we come at last to STEEL 52, the final issue of the series. 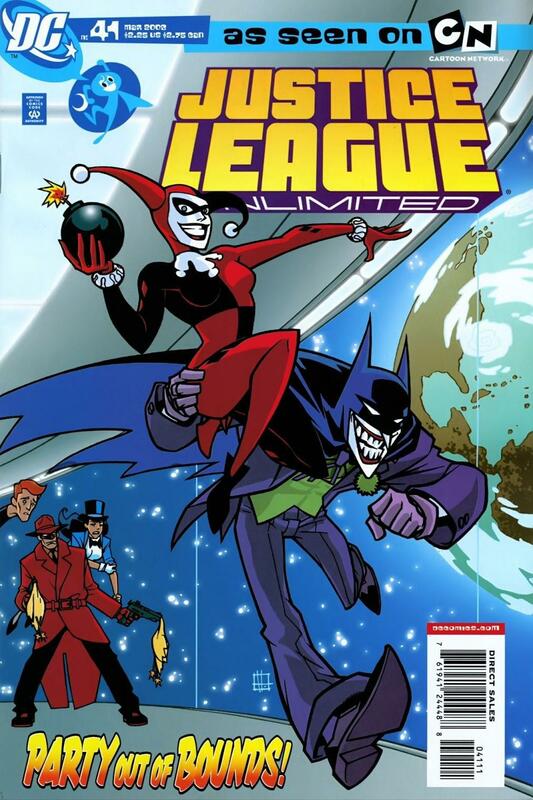 While I'm not certain, that has to make it DC's longest running title starring a person of color, right? This issue is crammed to the bursting point, as the creative team rushes to tie up as many dangling plots as they can. They had very little advanced warning of the cancelation. Job-hunting's the subject of this issue, as Natasha searches for a job, Skorpio applies for a job, and Steel hires extraterrestrial bounty hunter Glenn Gammeron (who was a Justice League member for five minutes) for a job. 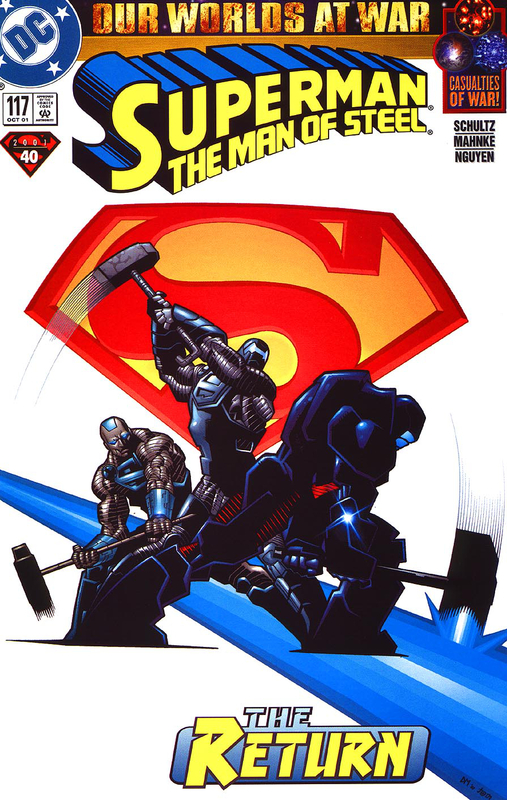 STEEL 50 was slated to be part 7 of 9 of the "Millennium Giants" cross-over event that ran through a bunch of DC's books. Priest asked them not to do this. He implored DC not to involve STEEL's fiftieth issue of all issues in an event whose other eight chapters would occur in other books, an event where Steel was just one player among a dozen. He begged the higher-ups to allow him to give the long-time Steel fans the milestone issue they deserved. Steel embarks on a mission of mercy that runs into complications, as superhero stories are wont to do. Throughout the run, Steel's brother Clay Irons has been lurking in the background, secretly working to keep Steel and Natasha safe in his own criminal way -- that and taking possession of a pair of Steel's flight boots. This issue, we get his full story. This one's a Christmas issue.